Hydrostatic and osmotic pressure are opposing factors that drive capillary dynamics. Capillary exchange refers to the exchange of material from the blood into the tissues in the capillary. 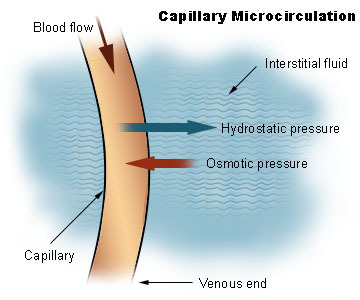 There are three mechanisms that facilitate capillary exchange: diffusion, transcytosis and bulk flow. Capillary dynamics are controlled by the four Starling forces. Oncotic pressure is a form of osmotic pressure exerted by proteins either in the blood plasma or interstitial fluid. Hydrostatic pressure is a force generated by the pressure of fluid on the capillary walls either by the blood plasma or interstitial fluid. The net filtration pressure is the balance of the four Starling forces and determines the net flow of fluid across the capillary membrane. Capillary exchange refers to the exchange of material between the blood and tissues in the capillaries. There are three mechanisms that facilitate capillary exchange: diffusion, transcytosis, and bulk flow. Diffusion, the most widely-used mechanism, allows the flow of small molecules across capillaries such as glucose and oxygen from the blood into the tissues and carbon dioxide from the tissue into the blood. The process depends on the difference of gradients between the interstitium and blood, with molecules moving to low-concentrated spaces from high-concentrated ones. Transcytosis is the mechanism whereby large, lipid-insoluble substances cross the capillary membranes. The substance to be transported is endocytosed by the endothelial cell into a lipid vesicle which moves through the cell and is then exocytosed to the other side. Bulk flow is used by small, lipid-insoluble solutes in water to cross the the capillary wall. The movement of materials across the wall is dependent on pressure and is bi-directional depending on the net filtration pressure derived from the four Starling forces that modulate capillary dynamics. Capillary Dynamics: Oncotic pressure exerted by proteins in blood plasma tends to pull water into the circulatory system. Due to the pressure of the blood in the capillaries, blood hydrostatic pressure is greater than interstitial fluid hydrostatic pressure, promoting a net flow of fluid from the blood vessels into the interstitium. However, because large plasma proteins, especially albumin, cannot easily cross through the capillary walls, their effect on the osmotic pressure of the capillary interiors will to some extent balance the tendency for fluid to leak from the capillaries.In conditions where plasma proteins are reduced (e.g. from being lost in the urine or from malnutrition), or blood pressure is significantly increased, a change in net filtration pressure and an increase in fluid movement across the capillary result in excess fluid build-up in the tissues (edema). Capillary fluid movement occurs as a result of diffusion (colloid osmotic pressure), transcytosis, and filtration. Bulk flow is used by small, lipid-insoluble solutes in water to cross the the capillary wall and is dependent on the physical characteristics of the capillary. Continuous capillaries have a tight structure reducing bulk flow. Fenestrated capillaries permit a larger amount of flow and discontinuous capillaries allow the largest amount of flow. The kidney is a major site for bulk flow transport. Blood that enters the kidneys is filtered by nephrons, the functional unit of the kidney. 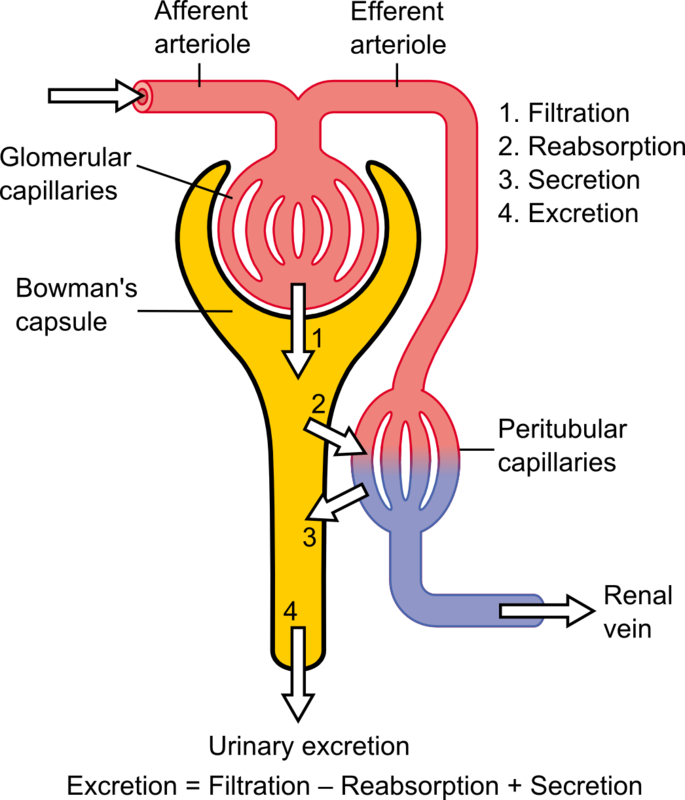 Each nephron begins in a renal corpuscle composed of a glomerulus containing numerous capillaries enclosed in a Bowman’s capsule. Proteins and other large molecules are filtered out of the oxygenated blood in the glomerulus and pass into Bowman’s capsule and the tubular fluid contained within. Blood continues to flow around the nephron until it reaches another capillary-rich region the peritubular capillaries, where the previously filtered molecules are reabsorbed from the tubule of the nephron.